Hundreds of bison skulls washed onshore below Oahe Dam when the Missouri River flooded in 2011. The river refused to yield an item of great historic interest, though: an anchor that has lain at the bottom of the river for more than two centuries. The anchor came to rest in the silt of the Missouri River the night of Sept. 27, 1804, after being cut from the keelboat used in the Lewis and Clark Expedition. The Corps of Discovery, as the scientific expedition was called, consisted of 45 men traveling in a keelboat and two flat-bottomed boats called pirogues when it left Camp Dubois, near St. Louis, Mo., in May 1804, according to Elin Woodger and Brandon Toropov’s Encyclopedia of the Lewis & Clark Expedition. The expedition entered what is now the Fort Pierre/Pierre area in late September 1804. The expedition’s time with the Lakota was marked by confrontation and feasting. On the evening of Sept. 27, Clark and some of the men were in a pirogue, returning to the keelboat, after feasting with the Lakota and watching the women dance. The pirogue hit the keelboat’s anchor cable and broke it. Expedition members hunted unsuccessfully for the anchor in the Missouri River’s silt the next morning, then continued on their journey upriver. In the late 1970s, Cliff Jorgenson of Fort Pierre was scuba diving in an area off the swimming beach downstream from Oahe Dam. What he saw was a six-inch piece of cast iron sticking out of the sandy bottom the Missouri River. It was the point of an anchor about 4 feet, 6 inches long, weighing about 95 pounds, and having a 4-foot crossbar. Jorgenson recovered the anchor and it found a home in his basement. The location of where the anchor was found and its age led some to believe that the anchor was the one lost by the Lewis and Clark Expedition. Probably not, was the answer given by Lewis and Clark scholars and maritime experts. Their reasons were that that type of anchor with a crossbar did not become popular until the mid-19th century, after the Lewis and Clark Expedition. Also, at the time of the expedition, the keelboat would have used the anchor as a portable strong point. The anchor would have been taken upstream in a smaller craft or by foot and locked into something solid. Then the keelboat would have been pulled to that point. The weight of the anchor probably made it too heavy to do that. 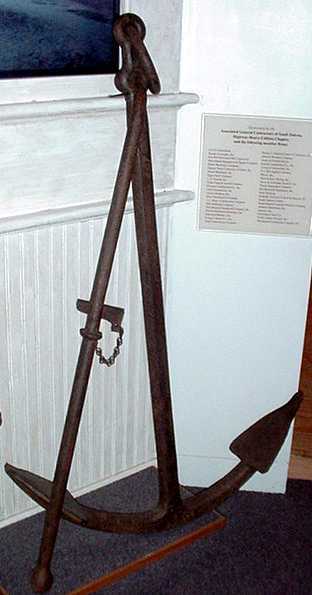 Jorgenson donated the anchor he found to the South Dakota State Historical Society. It is on display in the museum at the Cultural Heritage Center in Pierre as part of the “On the Big Muddy” exhibit. As for the lost anchor, at least two theories abide regarding it. One is that someone found the anchor, retrieved it and did not let the find be known publicly, not realizing the historical significance of the anchor. The other theory is that the anchor is still waiting to be found under the Missouri River silt. It’s one of history’s mysteries.